Home » Anime/Manga » Re:tro Re:view – Castle in the Sky! Re:tro Re:view – Castle in the Sky! Written by: JediJondee46 on August 28, 2017. Studio Ghibli Fest 2017 continues with Castle in the Sky, it is also running in theaters on August 28th, today!, and August 30th (so there is still time to see it!). It is written and directed by Hayao Miyazaki with another great score by Joe Hisaishi. This is really not one to miss, it is most in line with Western sensibilities, with young protagonists and action. 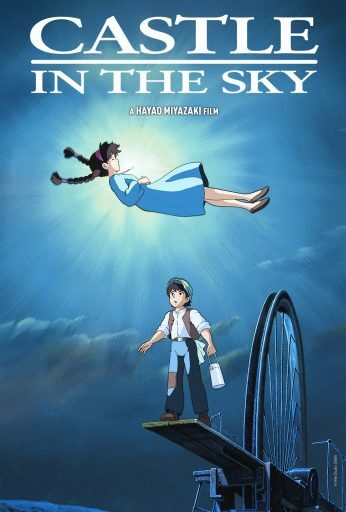 The other part was that I realized that if I could only have three films, a trilogy or collection of movies, and no other entertainment, I would choose Studio Ghibli with Castle in the Sky as one of the three (along with My Neighbor Totoro). The other realization is that this is the ultimate Steampunk movie! It is set around 1868, offers steam powered locomotive as the most advanced tech, and airships, but also has technology that is far advanced than our time. Really the designs and sheer beauty of the animated landscapes are far beyond anything in Disney animation. We get an airship carrying the young girl Sheeta voiced by Anna Paquin. She of course is known for True Blood and playing Rogue in the X-Men films. Sheeta is an innocent caught up in this conflict between an army and pirates. Above the airship is the Tiger Moth, a flying contraption that looks like the head of a rooster (the cockpit) mixed with zeppelin back and wings with giant propellers! It contains pirates led by Captain Dola masterfully voiced by Cloris Leachman. There is a brazenness to her character, absolutely driven for treasure, yet there is a softness to her that later shows up, complex and fun. The pirates have flapter ornithopter vehicles that have dragonfly wings to raid the airship. They use gas cartridges to take down the airship’s security detail. Dola desperately wants the crystal that Sheeta has in her possession. During the battle, Sheeta uses a bottle to knock out her captor, Colonel Muska, who is voiced by Mark Hamill. This was six years before he voiced The Joker in Batman: The Animated Series and Hamill brings an aristocratic air and manipulation to the villain. Once he is unleashed, he has a maniac laugh that brings shades of The Joker. Sheeta tries to climb out to the side of the airship. A pirate tries to reach out for her and Sheeta plunges from the sky! Credits until we get the mining town in a place called Slag Ravine. The plunky Pazu works there getting food for his boss at the mine. Pazu is voiced by James Van Der Beek who of course is known for Dawson’s Creek. He is resourceful, but also just driven to save Sheeta. All of Miyazaki-san’s characters are perfect. Pazu is about to return when he sees something glowing in the sky. This is the crystal that the unconscious Sheeta wears and has slowed her descent until she floats slowly to the Earth! Pazu races to see the glow and finds that it is a girl. She is slowly headed to the mine shaft and Pazu is able to bring her in from a platform, but once the crystal rests against Sheeta, her full weight has him straining to rescue her. Pazu can’t get his boss to take notice of Sheeta so he brings her back home. Sheeta is wakened by Pazu playing his trumpet on the roof. She discovers that Pazu’s father took a picture of the floating city of Laputa in the clouds. Pazu relates that it was difficult for his father to fly through two alternating wind currents, but his find was dismissed by others so it is a life long quest to find Laputa. The flying island was introduced by Jonathan Swift in Gulliver’s Travels. It was really a chance for Swift to satire the ridiculous and ultimately pointless scientific experiments. Captain Dola’s crew, really her sons, are searching the town for Sheeta. Pazu tries to hide her in a coat and hat, but the hat comes loose and the pirates see her braids. The pirates chase them until Pazu reaches his friend’s house. A pirate threatens them by ripping his shirt with his muscles and Pazu’s mining friend does the same, this is hilarious! Pazu and Sheeta try to escape on a small, mining train, but Captain Dola pursues them in a car that rips apart the railway track. There is another complication with the military’s tank that fires on the pirates. Pazu holds onto a piece of the broken track with Sheeta, but they both fall and are saved by the crystal, this is later explained as aetherium, crystals that power Laputa. The duo has to escape Muska, who has captured a bit of Laputa technology that fell, a robot with long, telescoping arms, and team up with the pirates. They have to somehow reach the mysterious castle in the sky and find out it’s mysteries which will change the course of their world. Five Aetherium crystals out of Five!